This week’s exercise: compare and contrast the conflict in football and in poker. Conflict is another core component of games. 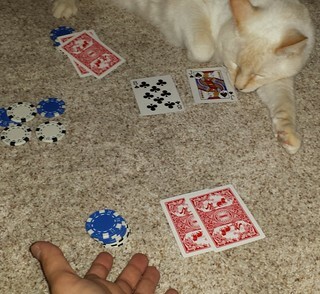 A player asking for a card in Go Fish is also revealing to the other players what type of card is in his or her hand, making it easier for them to play, but not asking means a player can’t complete any piles. In soccer, a team pushing forward on the attack risks the defenders launching a counter-attack if they lose the ball. If you play a game such as Pac-man, your goal is to eat all of the dots in the level. Sounds easy, except the level is a maze, so it forces you to move through it by avoiding walls, and the maze features four monsters trying to kill you. In all of these cases, the rules of the game ensure that the goal isn’t very easy to accomplish. A player’s actions tend to result in potential problems for themselves. Purchasing an upgrade in a strategy game means a lack of resources to spend on anything else, but not upgrading could mean a lost opportunity to win a decisive battle later on. In American football, each side sets up their players at the line of scrimmage. When the play starts, the team in possession of the ball is trying to advance to the opponent’s end zone, while the defense is trying to stop them. The offense tends to have a variety of plays and formations to choose from, and the defense tries to anticipate the play as best as they can. But the point is that each team is trying to anticipate the moves of the other. If a long pass is going to happen, you don’t want your defenders trying to deal with anyone closer to the quarterback, but at the same time, you don’t want to allow a short pass to turn into a first down of 70 yards because all of your defenders are at the far end of the field. In poker, each player knows the cards in his or her own hand, but no one else does. Keeping the quality of your hand a secret is a big part of the game. If you have a really good hand, you want your opponents to bet more money so you can win it, but if you inadvertently communicate how good the hand is, your opponents may fold, which renders your good hand useless. Similarly, if you have a bad hand, you could fold, or you could try to make it seem as if your hand is much better than it is in order to get your opponents to fold in case their hands aren’t much stronger. With poker hands, you don’t know what you’ll be dealt, but you can control how much you bid based on your own incomplete knowledge of the current state of the game. And of course, you can try to control your own facial tics and other body language that might give away what you know while simultaneously studying your opponents for their own tells. While football is a game that runs in fits and starts, once a play is in motion, it’s a real-time situation. Lateral passes might move the ball around the field in ways that the defense didn’t anticipate, and fumbles result in quick scrambles to gain or regain possession as quickly as possible. Physical strength and dexterity plays a key role. A defender better have the ability to take down 300+ lbs of running muscle and armor. Poker, however, is turn-based, and once a bid is made, it can’t be taken back. Playing a hand is very procedural and uses a regulated set of moves. The skill comes from decision-making and bluffing, not in physical dexterity. But in both football and in poker, there are psychological games being played involving the hidden information inherent to the game. Poker hands are secret, as are football offensive and defensive plays. Sighing after looking at your cards can communicate that you think you have a terrible hand, or it could communicate that you’re merely trying to make your opponent think you have a terrible hand when in fact you have a good one. Bidding all-in when you have a two of diamonds and a three of clubs might force your opponent to fold, or it could be a really stupid gamble if your bluff is called. Similarly, if your offensive formation is heavily unbalanced, it might indicate that you are trying to protect a runner on one side of the field, or it might be a ruse to force the defense to leave the other side of the field wide open for a pass or run. Faking a field goal attempt when you are actually making a run for the end zone or having your fastest defenders stay back farther to give the illusion of a gap that the offense will try to run through are ways in which you might try to anticipate how your opponent will react. If you knew how the other players were going to act, you could choose the course of action that would be guaranteed to give you the advantage. Since you don’t know, your choices are made based on what you think will happen, and you and your opponents are both trying to be unpredictable while also trying to make the best moves. While football has physical challenges that poker doesn’t, and poker has random draws of cards while football has no real randomness besides the coin flip at the start of the game, both games involve players trying to understand their opponents and predict what will happen next. And since the human mind is so complex, it’s not easy to figure out what other people are doing before they do it. Next week, I’ll focus on using challenge, which is related to conflict, to engage the player with the game.